The truth is that Kobe is the one who blew it. As you can clearly see, the old white guy comes at the situation with solid technique, seeking to execute a standard handshake-fingersnap-dap combination. 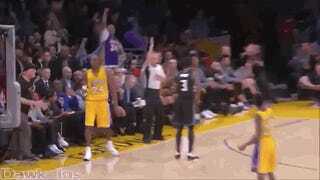 Everything would have been just fine if Kobe hadn’t stuck his hand out there like rigor mortis was setting in. Keep your chin up, old guy, for you did not play yourself.